The GOP came out of this year’s election with more seats in the House of Representatives than they did 16 years ago, but short of the total the party amassed then in Senate seats and governorships. And while Republicans captured both the Senate and House in 1994, this year they won only the House. Yet in each of the landslides they emerged with a clear majority of the nation’s governorships and scored healthy gains in state legislative races – both particularly important these days on the eve of the next round of congressional redistricting. Governorships in Connecticut and Vermont shifted to the Democrats as did those in Hawaii and California, the nation’s most populous state. Democrats could pick up another governorship in Minnesota, where the race is headed to a recount with Democrat Mark Dayton leading by about 9,000 votes. In the meantime, the total of Republican governorships stands at 29, one short of the number they held after the 1994 election. Republicans exit the 2010 midterm election with more House seats than they did in 1994, but short of the total they amassed then in Senate seats and governorships. 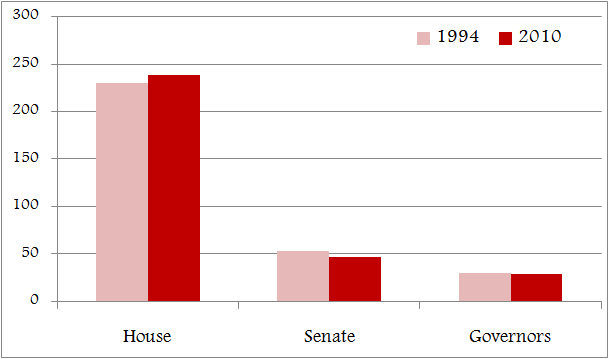 The big difference between the two elections was that the GOP captured both the Senate and House of Representatives in 1994, while this year they won only the House. In each election, they emerged with a hefty majority of the nation’s governorships. That brings us back to the House, where the Republicans made their greatest mark in 2010. This year’s GOP gains exceeded the party’s combined losses in 2006 and 2008, when the Democrats won – and then expanded – their briefly held House majority. Republicans also registered major congressional gains this election in the Midwest and the Northeast, the latter a region where their numbers in recent years have shrunk to a corporal’s guard. They picked up five seats in the battleground states of Ohio and Pennsylvania, at least five seats in New York (where two races are still undecided), four seats in President Barack Obama’s home state of Illinois (including that of Democratic Rep. Melissa Bean, who conceded her race Nov. 16), and two seats in New Hampshire – ending the GOP’s brief shut out in New England. The Republican landslide of 2010 was a bit larger in the House of Representatives than that of 1994, although there were a number of similarities in the scope of the gains. In terms of geography, the GOP picked up more seats in the South each time than any other region, followed closely by the Midwest. In terms of political terrain, the largest number of Republican gains in both ’94 and this year were scored in “red” districts – those that voted for Republican in the previous two presidential elections. And in both midterm landslides, Democratic freshmen were the prime casualties among the incumbents that lost, with second-termers also suffering a particularly heavy number of losses this year. 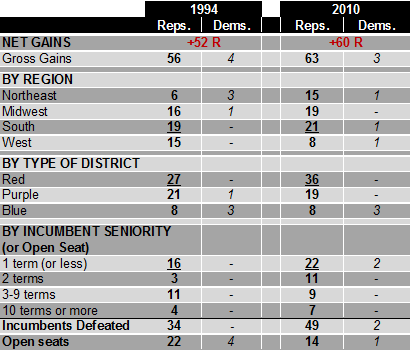 Democratic House gains were minimal in both 1994 and 2010. Northeast – CT, DE, ME, MD, MA, NH, NJ, NY, PA, RI, VT, WV. Midwest – IL, IN, IA, KS, MI, MN, MO, NE, ND, OH, SD, WI. West – AK, AZ, CA, CO, HI, ID, MT, NV, NM, OR, UT, WA, WY. In the second section, “Red” districts are those that voted for the Republican candidate in the previous two presidential elections – 1988 and 1992 prior to 1994; 2004 and 2008 in advance of 2010. “Purple” districts are those that voted for different parties in the previous two presidential elections. “Blue” districts voted for the Democratic presidential candidate both times.